← Extreme Misogyny in Syrian Salafism! My friend in Damascus tells me that there will be no need for Christmas trees in Adra this year (a Christian town to the north-east of Damascus) as Christians and Alawites have had their severed heads hung from trees in a macabre mockery of Christian festivities. According to Al Alam reporter Mazen Salmo, militants from the terrorist Liwa al-Islam group, and Al-Qaeda’s al-Nusra Front attacked Adra during the last week and started killing people, family by family. A video showed piles of dead bodies in houses, among them children, which were killed during militants’ attack. Local witnesses told Salmo that militants attacked Adra’s super markets, fuel stations and bakeries as they entered the city and scared people off their way. An unknown number of people have been abducted by militants while many have been killed in their homes, the reporter said. Local reports also say that people have been executed in Adra following al-Nusra Front attack on the town, and some have said more than a hundred people have been killed by militants in last couple of days. Local resistance forces are still fighting the militants in parts of the town, Salmo said, as the country’s army is largely focused on its battle in the strategic Qalamoun area near capital Damascus. “It seems that militants are trying to drive army’s attention toward Adra from Qalamoun,” Salmo said. Militant forces have suffered heavy losses in the Qalamoun fighting. They have also called for a mass mobilization against Syrian army which has shown a strong face in defending capital from militants’ threat. 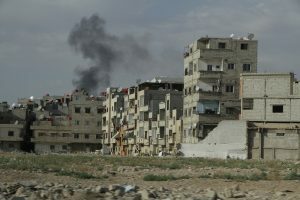 Nearly three years of crisis has taken its toll on the lives of around 126,000 people in Syria, according to new statistics compiled by the United Nations. Millions have also been displaced due to the turmoil. This entry was posted in Article, syrian rebels and tagged Christmas Trees, FARS, Mazen Salmo, Nusra Front, syria. Bookmark the permalink. Hi. Can you please tell me where I can link to this video you mention ? (Not because I don’t believe it happened, but with so much misinformation and propaganda on both sides, it is important, if painful, to examine available evidence for all events. I presume you would agree.) Thank you. The video is mentioned in the FARS News article that I’ve included above. See the original article (english.farsnews.com…) for the source. My main news feed on these events is from a friend in Damascus who would prefer to remain nameless (for obvious reasons). The report of the macabre ‘Christmas trees’ came from her.